The sleek and understated qualities of silver and steel make them the ideal way to bring an air of elegance to your home. The reflective surface enables pieces to blend sympathetically with their surroundings, while subtle tones bestow a modesty that allows the shape and design of an object to speak for itself. There are a number of boutiques within The Royal Exchange offering beautiful silverware creations that blur the lines between decorative and practical purposes, to striking effect. Ideal for red wine, sherry or port, Searle & Co.’s Agatha decanter is crafted from Dartington crystal and mounted with sterling silver. Airing such drinks before serving releases the more complex aromas for an enhanced flavour. Those who prefer something sparkling will appreciate the elegance of the brand’s silver stemmed Champagne flutes. Sold as a pair in a beautiful presentation case, they make an excellent gift for a special occasion. 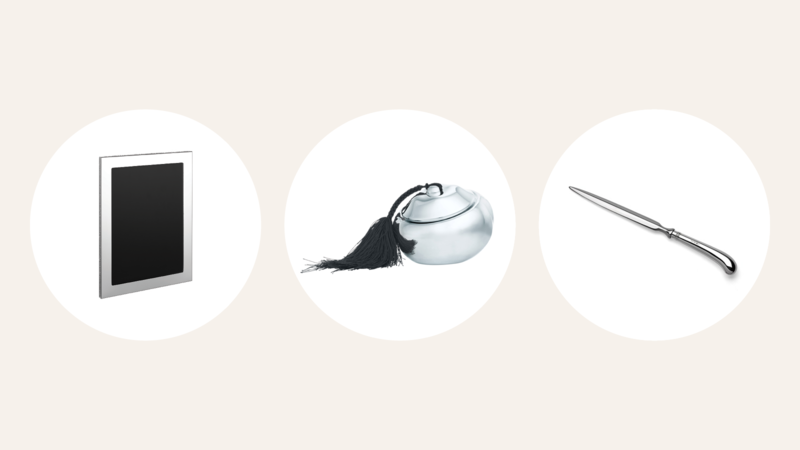 Danish design house Georg Jensen offers a wealth of beautifully crafted silver and stainless steel items that embody the sleek and minimalist style synonymous with the brand. 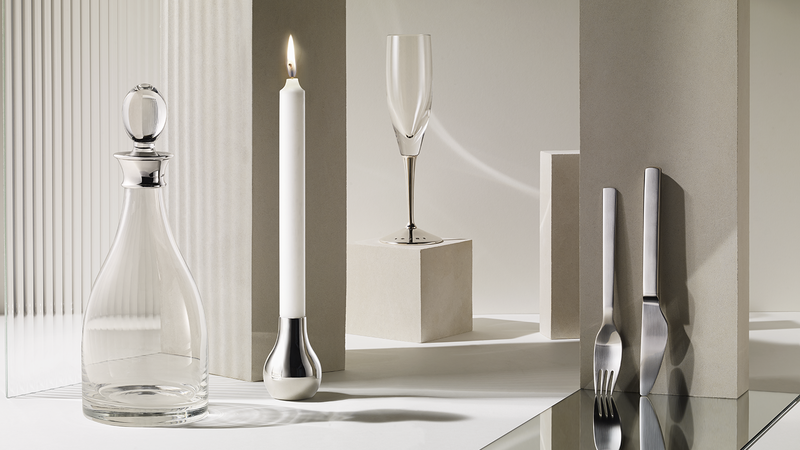 The Cafu candleholder by design duo HolmbäckNordentoft features a softly contoured, bulb-shaped base that will emanate the ambience of its surrounding making it the perfect centrepiece. The New York cutlery collection was designed by the late, legendary Henning Koppel, who produced an expansive array of work for Georg Jensen during his lifetime. His designs adhere to strict rules on functionality, without negating the value of beauty, drawing on organic lifelike shapes to create products that encapsulate both attributes. Display one of your favourite photographs in a frame that won’t detract from its contents. Links of London’s silver-plated Words frame will sit comfortably in most surroundings making it a failsafe gift, or addition to your own home or office. Keep trinkets and small items tidy by investing in Elsa Peretti’s artful sterling silver Pumpkin Box from Tiffany & Co. Whether you use it to store jewellery, cuff links, paper clips or keepsakes, the unisex appeal of this fun design will look as elegant on your dressing table as it will your desk. Aspinal of London’s sterling silver letter opener turns an every day task into a pleasurable moment. A diamond cross-section blade ensures the utmost efficiency, while its handle, modeled on a rattail pistol, ensures both a satisfying grip and elegant aesthetics; the perfect addition to any writing desk. The Royal Exchange houses a vast collection of objects for the home within its many boutiques, from silverware and china to artwork and audio technology.